Claim: November 2013 is the 'warmest ever' – but will the real November 2013 temperature please stand up? | Watts Up With That? The combined average temperature over global land and ocean surfaces for November 2013 was record highest for the 134-year period of record, at 0.78°C (1.40°F) above the 20th century average of 12.9°C (55.2°F). Other maps from GISS suggest the NCDC presentation might be stretching the November temperatures a bit in the SOTC report, possibly because of the NCDC choice of baseline period. Clearly, how you calculate and present global temperature anomalies makes a difference in the answer you get for November. The difference here is that NCDC is using the “20th Century Average” where the other sources are using accepted 30 year climatology periods. Choosing that period can make a big difference in the outcome. [Added: Also pointed out in comments NCDC has a lot of data gaps in Russia. The point I’m making is that global temperature can be significantly different, depending on how it is calculated and presented. Which way is the right way? More importantly, since monthly temperatures still fit into the scale of synoptic meteorology, i.e. affected by “weather”, does it even matter to the global warming debate? Global temperature on monthly and yearly time scales varies greatly depending on how it is calculated, how it is presented, and who presents it. Which one is the real global temperature? Addendum: I have been wondering about that Russian red spot for 5 years. I’ve seen this red spot come and go in Russia, and I don’t know what the reason is. In the cities, it’s the municipality that supplies the hot water. There’s a huge network of giant pipes that move the water all over the city. It’s a closed circuit that eventually leads back to a steam plant – a huge factory that does nothing more than heat water and force it into the system. The pipes enter practically every building within the city limits and the heat from uninsulated pipes (radiators) is what keeps everyone’s living space toasty warm throughout some extremely cold winters. A side benefit is that they never have to wait for the water to warm up in their showers! The caption was telling: Smaller Russian era dwelling – blue is typical color. Pipes outside are for the steam heat that is distributed to all buildings. Anybody stop to think that this anomaly might be something other than natural? It just so happens that there is a blob of heat the size of Russia centered on Russia? What are the odds of that? The “real” one is the one that promotes the meme. The truth is the casualty. I should clarify that I mean it could be caused by someone messing with the satellite data in some way, or Russian military equipment possible messing with the satellite data. As is, the very existence of an anomaly like that seems rather odd to me. RSS vs GISS, the same normal period: check for yourself. 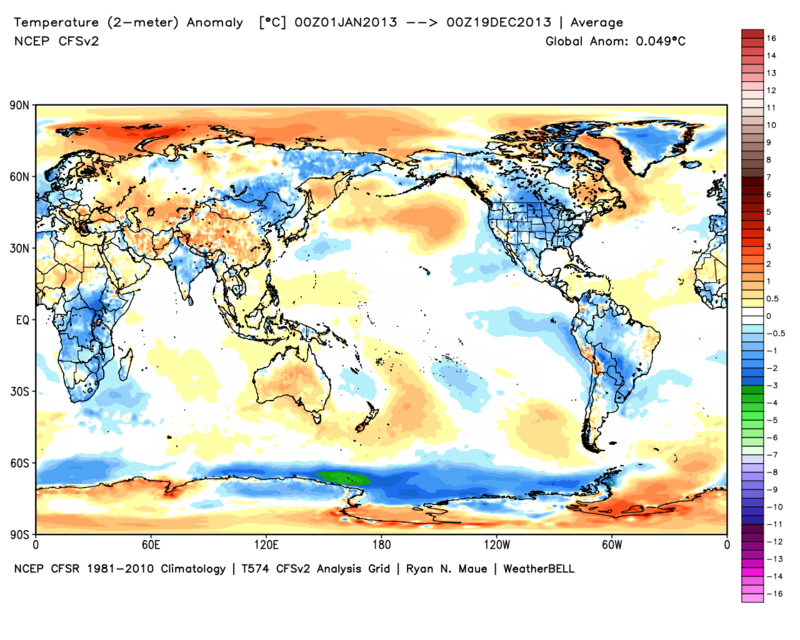 Note that there’s absolutely no coverage in several tropical areas where WeatherBell reports cold anomalies (e.g. in Africa and the Amazonas). I don’t know where I read it, but the Russian data may depend on what period the base line was measured. Back in the days if the USSR, the amount of fuel you received for next year’s winter, depended on how cold it was this year. So, it was normal for places in Siberia to routinely report temperatures which were significantly colder than they actually were. Thanks Anthony, Glad to see articles like and I do know they take lots of time to put together. I am simply not buying that it was really THAT hot over an area THAT big. Something is not right. Have we looked at the raw station data to make sure there isn’t anything stupid there? There is nothing ‘accepted” about a 30 year base period. You can pick any base period you want. You dont want to go below 30, but picking a longer period will give you better statistics when it comes to measuring extrema. Climate “normals” are reference points used by climatologists to compare current climatological trends to that of the past or what is considered “normal”. A Normal is defined as the arithmetic average of a climate element (e.g. temperature) over a 30-year period. A 30 year period is used, as it is long enough to filter out any interannual variation or anomalies, but also short enough to be able to show longer climatic trends. The current climate normal period is calculated from 1 January 1961 to 31 December 1990. NOAA’s map makes no sense for the UK, Ireland or for Spain – particularly for Spain, Ireland and Scotland which NOAA suggests all had warmer than average Novembers in 2013. If you look at the Spanish Government’s own web-site they confirm that November 2013 was cooler than average and in the ‘very cold’ category in the whole southwest half of the country. Equally in England it was a full 1C/2F cooler than the 1981-2010 period according to the UK met office and was also cooler than normal in Scotland. The Irish met service also confirms a cooler than average November. This illustrates that NOAA’s map bears no relation to reality in these particular countries. I suspect others looking at data in other countries would find something similar. NCEP uses datasources that are highly suspect. for example thermometers on rooftops. thermometers on roads. 12.9’C 20th century average? I thought it was 15’C, oh wait they revised it to 14’C, damn I’m confused. Maybe that is their diabolical plan. Plenty of “highest on record” comments in the NCDC report. All carefully worded. So what is the period of “record” they are using? Its the last 134 years appx 1900 to present. Which is pretty meaningless in terms of “climate cycle” context. And then notice the several different base periods for various of their claims. Manipulating the period you are comparing against is a simple way to manipulate the result. How terrible. 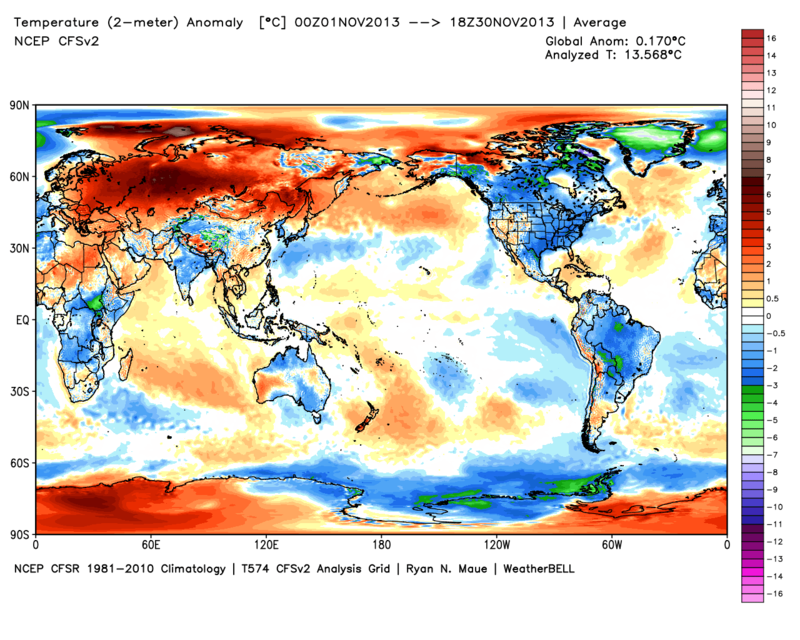 Combined global land and sea temps combined for NOVEMBER was 0.78 degree C above the 20th century average. Sounds reasonably accurate to me – most skeptics agree temps have increased over the last 134 years. “The combined global land and ocean average surface temperature for the YEAR-TO-DATE (January–November) was 0.62°C (1.12°F) above the 20th century average” …. so the AVERAGE YEAR TO DATE global mean combined land and sea temps are just 0.62 degree C above the 20th century average. Using the total, year to date data, the global mean combined land and sea temp of just 0.62 deg C over the last 134 years. Which shows the HADCRUT, HADSST, and RSS MSU data, and other data largely matches the NCDC GCHN data and conclusions. The NCDC climate “report” carefully crafted its talking points to provide maximum scaremongering value. It also carefully ignores the inconvenient pause.And they bury the graphs they do, quite clearly, show the pause. I’ll help them out – you can see their graph below. It is clear there has been no appreciable change – no warming – in the combined global mean land and sea temp data, since at least 2000 … and likely earlier. Note that NOAA has largely “disappeared” the large warm spike in 1998. Which also eliminates the warmists claim that the “pause” is only discernible if one cherry picks and includes the unusually warm 1998 as the start point. This simply is not true. You can ignore the rapid oscillations of the 1997-1999 period that include the warm spike in 1998, and use 2000 as a start point and you’ll get 14 years with no warming. The data shows that there has been no increase in global mean temp for at least 14 years …none if by land, none if by air, none if by sea, and as this NCDC report shows, none if by land and sea combined. Add the NCDC’s GHCN combined land and sea data set to the HADCRUT, HADSST and RSS MSU global mean land, sea and lower troposphere air temps respectively, which all show the “pause” – that we have seen NO warming since at least 2000 or earlier. Thanks for the reply, Anthony. Those steam pipes alone, uninsulated… The urban heat island effect is already bad enough. A factory just for producing steam and then pumping that steam all over a city? That HAS to have an affect! The make a point on other possibilities, I was once told about (though this is unconfirmed) a military base in Manitoba (Canada) that uses radar jamming to hide the base. The problem is that weather satellites see the jamming as rain! I wonder if something in Russia is doing something similar to the temperature satellites, if such a thing is possible. So the cooked data shows “hottest ever” and the uncooked data does not. Uhuh. NOAA, GISS, etc are not measured temperatures. It is value added, adjusted, homogenised, etc. Or spliced and diced as they do at BEST. That .6 degree is all in the adjustments. If we can credit the climate cause with anything worthy of note, it’s the truly breathtaking array of reds they have run through and embellished our maps with, oft without perspective or scale. Every one of them now looks like we wrapped up the teenaged extras from Carrie in them. Lucky for Russia, they’ve moved beyond ‘blood red’ to ‘tonight we chacha with Lucifer red’. Congrats! Let’s suppose the situation were reversed for some reason. For instance, let’s say that air conditioning electricity was priced lower if the preceding year had been hotter in some huge and imaginary rich tropical country, and reported temperatures had been elevated in the past as a result. Instantly, an IPOCC team would be dispatched to interrogate knowledgeable persons there to verify if this had happened, with a view to “getting rid” of that warm anomaly by subsequently adjusting its temperatures down. Three guesses why such an investigation and adjustment won’t occur wrt Russia. It will be interesting to see what happens when late CLIMAT reports come in. One of the problems with NCDC is deadline pressure in issuing such reports, they don’t wait for all the data to show up. And here I thought an oscillation involved some areas being down while others are up. The Arctic oscillation rotated from Siberia to the U.S. and then Europe and the Middle East. That pattern was predicted by private forecast groups for commodity traders but missed by government forecasters. It appears that the focus on all things warming and evil takes time and talent away from other competencies. Just ask EPA and their CIA workforce. I wonder if recent Russian high temperatures have anything to do with vodka rationing. The end of the 1980s saw a huge Russian budget deficit and sky-high inflation. Severe shortages of basic food supplies led to the reintroduction of the war-time system of rationing – including vodka. Apparently, food and especially vodka rations were based on low temperatures of each district or town and communities competed for food and vodka allocation. Temperature records were often exaggerated on the low side to make sure rations were high. Clearly this would produce an artificially low bias on temperature records during that period and make current temperatures seem high. But now there is more ice in the Arctic……but your point is well taken. Large land locked areas, far from moderating influence of sea or ocean, will have larger swings in temps. The listing of metrics by their place in the record book seems to be very misleading. A lot of the data runs the ‘records’ are based on are quite limited. But the ranking itself seems to be potentially very misleading. Your take on this would very much appreciated. If nothing else, those steam pipes are a real eyesore. Indeed as things stand, a more alarming value will achieve a higher rate of replication in the media. The BOM in Australia is already getting ready to say that Sydney has had its hottest year ever, and that station’s records go back to 1959 or thereabouts. However, I had a look at the station near where I live in Western Sydney, and it’s been quite an average year. The record only goes back to 1995, but nevertheless, there have been hotter years previously. I don’t think urban heat losses, however substantial, can explain all of this anomaly. Russia is neither densely nor uniformly populated, and on a map like this all towns combined will hardly fill a pixel. It is true that towns leak a lot of heat due to central heating, although recently many central heating systems were dismantled or upgraded to use local regulators, so many people today can turn their heat down instead of opening the window. In the old days, we lived with windows open all year round; the only difference between seasons was in how widely open they were. I say, that was a much healthier lifestyle. Permanently fresh air at somebody else’s expense. But even then, the effects were localised. I remember seeing CIA-sourced winter-time infrared images of parts of Moscow and of my home town showing multiple intense hot spots. The resolution was so good I could see my car parked near the building where I lived. The story was that the authors of those images were puzzled, theorising about the kinds of activities that could create such a weird infrared signature. They did not see that anywhere else in the world and could not believe it was simply due to central heating and open windows. But in the big picture of things, those hot spots looked like sparsely located point sources. Spaces between buildings appeared just as cold as the empty field out of town. These temp anomaly maps would be great to see presented on a map of just the Northern Hemisphere (centered on the North Pole). I imagine that the Arctic would look quite ridiculous (unbelievable perhaps) with below average temperatures in the Western Hemisphere right next to greatly above average temperatures in the Eastern Hemisphere. The WMO disagrees with both of you. The WMO states that climate (except precipitation) can use 5 to 10 years as the base period. In general, the most recent 5- to 10-year period of record has as much predictive value as a 30-year record. Shorter reference periods allow normals to be calculated for a much wider range of stations than is usually possible for a standard normals reference period. For elements that show a substantial underlying trend (such as mean temperature), predictive accuracy is improved by updating the averages and period averages frequently. The sea ice page has been showing extensive snow cover in that Russian hot spot area for quite some time … at least a month it’s been this way … eyeballing it, it is further south than 5 years ago.To me it seems like if was well warmer than normal there would be less snow cover. Plenty of cold in America and Global Sea Ice 7th highest in 35 years….yawn. Please drop your data sets of 20 years…134 years et al. You need to compare over thousands and millions of years. This is the hottest we have ever been?…Someone is having a laugh. So what if the trend is up since the Solar Minimum’s…..the overall temp graph for our Holocene clearly shows we are much cooler than 10,000 years ago so the overall trend line is down. When ever Russia has a significant warm anomaly in places it always skewers global temperatures by the awful lack of stations there that rely on 1200 km interpolating. Only reason why there is a huge massive area well above average. No other data when not limited, shows much smaller areas with a anomaly anywhere near that big. Illustrates how interpolating at least 250 km to 1200 km messes up the data and gives false readings. The satellite data is superior in this sense by far and a shame media hype such alarmism when only cherry picking one data set that has been crudely put together. Looking back at some GISS maps, its seems clear that Russia has massive temperature swings. Gotta be the geography. But go look at some plots. One month they’ll be large sections 3-5C below normal, the next month the same area is 3-5C above normal. It looks like the “average” there is an average of extremes which NEVER happens. Huge fluctuations seem to be completely normal. It is not beyond president Putin‘s regime to make Russian met stations ramp up temps a bit, just to con the West and keep the ball rolling. They profit tremendously on self inflicted decommissioning of western industry. As the Soviet Union met its fate, the KGB survived intact, it owns the country. Steve Mosher But there is more ice in the arctic! So to summarize there is a standardized 30 year reference period spanning 1961-1990 which is apparently not used in any of the graphics? Got to love standards – there’s so many to choose from . . . If any nation on Earth is accustomed to dealing with a harsh winter, it would be Russia. But from the farthest reaches of Siberia to downtown Moscow, the Russian people are being pummeled by a winter so brutal it’s shattering cold-weather records across the continent — and it’s only December. As temperatures plunge as low as –minus 58 degrees Fahrenheit (minus 50 degrees Celsius) in some areas, the Pravda news site reports that 45 people have died of causes related to the subfreezing weather; 21 people froze to death in just one day. Hundreds more have been hospitalized with frostbite and other conditions. This winter is the coldest on record since 1938,…. There are many examples of cold WEATHER records around the world as well as odd snow in places like the Amazon and the Mediterranean. Need I go on? Have I made may point? 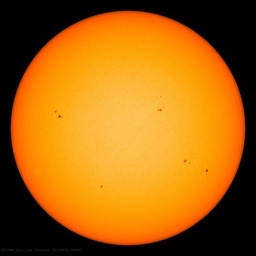 For regular updates on the sure signs of a new ICE AGE see below. What does the IPCC define as the period for climate? Take a look at HadCRUT4 and GISS for 2013. HadCRUT4 has been offset by 0.18 to make them both the same for January. Look at the many wild swings in opposite directions during the year. Something does not look quite right. Hmmm, record heat in Russia for November! Thank God! So, even Weatherbell is too warm. Interesting. Winter in Siberia is usually spectacular and always very cold. But this winter has been relentless. Week after week, temperatures have been dipping to 50 below zero. Siberians are accustomed to the cold, but they were completely unprepared for temperatures this low……. uah and rss temp. data is the most accurate we have. So a warm November in Russia is bad? What kind of sick thinking is this? Mosher has just hoisted himself on his own petard and argues like a sceptic without knowing it. On a different note, I spent time in Ukraine in the mid-90s. The distinguishing characteristic of the – barely – post-Soviet infrastructure was that it was mostly falling apart. For instance they don’t have trees of significant size in Russia so the middle and lower range electrical transmission lines, that we – in the US – suspend on wooden poles, are instead on reinforced concrete poles. The scary part is that the concrete doesn’t handle cold all that well – or theirs doesn’t – and the lower meter or two of the poles often consisted of nothing but exposed steel reinforcing rod. Poor and badly conditioned power supplies are a fact of life. In our project we needed clean power for or computers which were switchable but couldn’t handle the filthy power supply at any voltage. The line supply, nominally 240 volts, was measured oscillating from about 150 to over 300 volts within less than a minute. Electrical motors frequently failed in spectacular fashion. Our surge protectors, we carried a case of 12 in with us, all died within two weeks. I don’t think of them lasted longer than two and a half days. Happily, we had, despite insistence from Russian colleagues that it was unnecessary, brought in a small US built transformer that stepped the power down and produced clean, steady output. The Russian electrician became a convert to the idea of immigrating to the west after watching the input and output meters for 15 minutes and shaking his head. He expressed the opinion that there might be a market there. With respect to November 2013 being the hottest November. Clearly this was an isolated event that mostly happened in Russia and Asia due to an extra high positive AO. For Contiguous United States ,November was the 49 th warmest and most of North America was below normal temperatures. The ‘missing heat’ sure gets around…. The make a point on other possibilities, I was once told about (though this is unconfirmed) a military base in Manitoba (Canada) that uses radar jamming to hide the base. The problem is that weather satellites see the jamming as rain! Rumor, not (and probably very far from) fact; these ‘things’ are also verifiable with little effort today, too. Russia is a republican democracy. How hard would it be to validate their sites? WUWT reaches far and wide. Surface stations dot org could probably cover the nation in a matter of months. Well those months when it is possible to travel. 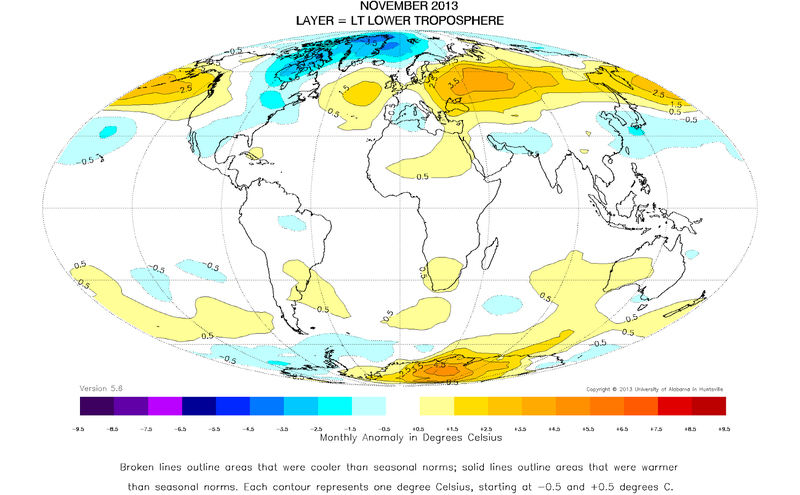 I think the best November ’13 (or any other date) lower troposphere temperature map is produced by Dr. Christy and Dr. Spencer at UAH. See http://nsstc.uah.edu/climate/ for maps from 2006. No UHI effect, no fudging the data. I noticed the increased snow cover over all of Russia as well, Scott. It started quite early, as I remember, and was well above average for November. I suppose milder temperatures might have given them more snow, but what then was created was a vast white area of fresh snow cover, much bigger than Greenland’s icecap, which was constantly creating cold air. Quite often I noticed this cold air didn’t hang around and get colder, but was swiftly exported north, via cross-polar flow, and once across the Pole it headed south into Canada. It messed up the plans of a lot of people attempting the Northwest Passage as the re-freeze began early, and is also a reason it has been colder than normal over much of the USA all autumn. Once you get into November the northern coast of Siberia starts to see 24-hour darkness, and five degrees above “normal” starts to be the difference between a “balmy” minus-twenty and a “normal” minus twenty-five. Right now there are parts of central Siberia way above normal, but still below zero, while parts of Eastern Siberia are at minus-forty. In no way, shape or form is Russia a place where any sort of warming occurs in December. Rather it is a vast, white land that loses huge amounts of warmth to outer space. Google giant Tesla coils found in Russia . Once found you will ask what the ****? What are they used for? I don’t think their water slides lol. It appears NOAA has a cohort of warmists – true believers – who manufacture creative graphs that can be used to push irrational policy. The following which is attached to Joe’s ‘Night Before Christmas’ poem, at icecape is a summary of the NCDC adjustment to the global anomaly temperatures. There needs to be an investigation and house cleaning. The warmists have corrupted the scientific process. Reality does not change if it is ignored. Policy needs to be based on reality rather than manufactured creative graphs. It is good thing not a bad thing that there is no extreme AGW problem to solve. We do not need to spend money on green scams to fight a problem that is not a problem. There is an extraordinarily long list of items this President and every President (applies to all countries) would like to spend more money on. Mission accomplished there is no extreme AGW problem to solve. 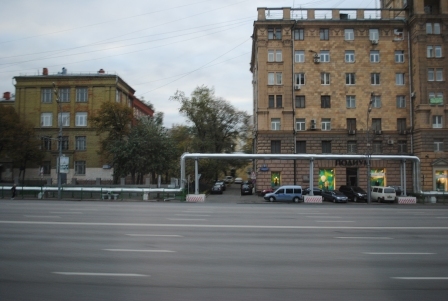 Google giant Tesla coils found in Russia . BS from jm. Shouldn’t you be out looking for snipes or Big Foot right about now? Make me wonder about the credibility of not only the CIA, but all of the government agencies. With all their money and resources, they didn’t think to send somebody out to take a look? Or ask a Russian? Even worse, how does Gene Selkov, a Russian, know all about what the CIA were thinking, and see their photos? Obviously, the Russians are a lot better at this spying business than we are. If the conspicuous and suspicious temperature anomaly over Russia was a cold anomaly, mainstream science would have corrected it. There is enough information in this post and others on here over the years for any reasonable individual to see the data is suspect and has been for years. Yet, it is accepted without question by warmists. I believe we’ve noted before that that “may change” is more often than not “will change” and in almost all cases the “complete data” reflects a slightly cooler number than the preliminary data shows. I’m with Jimbo, I did not think it’s cherry picking time. I like this analysis, especially the observation about steam heating for residents. It sounds like a great idea but it may well “contaminate” official temperature recordings. …Happily, we had, despite insistence from Russian colleagues that it was unnecessary, brought in a small US built transformer that stepped the power down and produced clean, steady output. The Russian electrician became a convert to the idea of immigrating to the west after watching the input and output meters for 15 minutes and shaking his head. He expressed the opinion that there might be a market there. Was this actually a ferroresonant transformer, or some kind of line interactive UPS? A straight transformer would merely have reflected the junk on the primary side to the secondary side. A ferroresonant can tolerate some ferocious swings, usually at the expense of some efficiency. It would make sense to provide a weather-resistant outside sheath to protect an insulating layer wound around or packed/sprayed onto an interior liquid/working fluid carrying pipe. Over time the ravages of wind and rain and even the rays of the sun take their toll on materials not designed to withstand outside exposure. It comes to mind, given the ‘look’ of that first, large silvery-looking pipe, that looks more like ‘duct-work’ than actual pipe, therefore, the conclusion would be this is cladding over a (perhaps) insulated pipe. A closer look at the supports seem to show that they bear the weight of something within the cladding, since the supports seem to ‘intrude’ into the cladding or sheathing. Months, or even decades are just an easily determined period for programmers, the variations in the weather/climate run right through the endpoints. I suppose we could extend out to centuries, but then the data becomes suspect. How did “we” ever let them get this far ? Don’t matter now, does it. Just gotta turn it around. Yes, Russia was warm but this is just weather synoptics. Parts have cooled off into December. @ Jim Is that all you got All I see is the truth must hurt your simple mind . I know were I’d like to stick my big foot. We had our own substation, too, so it may have been something on the premises at the TI Expressway site (the NE corner of LBJ Freeway and US-75) which had faulted, drawing down the mains momentarily until protective equipment (breaker etc) acted. These are what seem to have preceded the modern ‘UPS’ in common use nowadays. John, we’ve discussed this before; either you’re only 10 or an ID 10T. Hmmmm… Just a thought, about the Russian penchant for centralized supply and distribution of hot water for heating and bathing. It seems to me that turning off the hot water supply at the central heating plant becomes a very effective way to ‘domesticate’ unruly populations, especially during -30C weather. These are recalculated every 10 years so the most recent “climatology” is for 1981 to 2010. The definition also includes that the period end in year with a zero ending. The example given upstream is just that, an example. Perhaps that WMO page needs to be updated. I had the same impression, as I was reading the article and looking at the photos. Looked like a smaller diameter pipe jacketed with a larger diameter outer shield. Looked like a smaller diameter pipe jacketed with a larger diameter outer shield. Russians are crazy, but not that crazy. They do insulate. What we did see many years back was that in places where those pipes were on the surface and in somebody’s way, people would walk on them, destroying the insulation. I wonder how many folks haven’t a clue about that? These are cute birds with a long bill that some hunt with a shotgun. If you are asked to use a pillow case – that’s a scam. take a look where the new north magnetic pole is forming. right smack dab in the middle of the warming. You are almost certainly correct. Any chemical engineer with chemical plant or refinery experience would instantly recognize this installation. Insulation is usually quite fragile, and the covering is intended to provide some mechanical protection. Unfortunately too often the insulation is fiberglass which is cheap and effective but also a sponge. Anywhere that the protective covering is breached allows rain to saturate the insulation and now that section of pipe becomes a more effective radiator than if it were naked to the air. In the absence of additional water intrusion it will dry out only very slowly. Better is to use a calcium silicate based solid insulation product that had very low water absorption and suitable to 1,200F. Or you could use a closed-cell isocyanurate as long as you stay below 300F. A weather nosedive in Fort Collins this week could pull temperatures from the 60s to 10 degrees below zero as a Siberian system blows into Colorado. Not sure about Russia’s “high temperatures” but if there it’s the warm snow. This is nuts, for nuts only. I drive in and out of my local UHI on a daily basis. The UHI can be up to 10 F higher than the surrounding area. Emphasis on the ISLAND designation. UHI is just that, an island of air subverted by our activity, but does not migrate from its core. As areas grow, the UHI area grows and intensifies, thus warming appears to be taking place, which is of course bogus. I can’t figure out why weather people are so married to these UHI stations. They have no bearing or relative measure of the general area beyond their specific location. Airport stations are there so pilots can take off and land safely within the aircraft performance specifications. You are entirely correct. 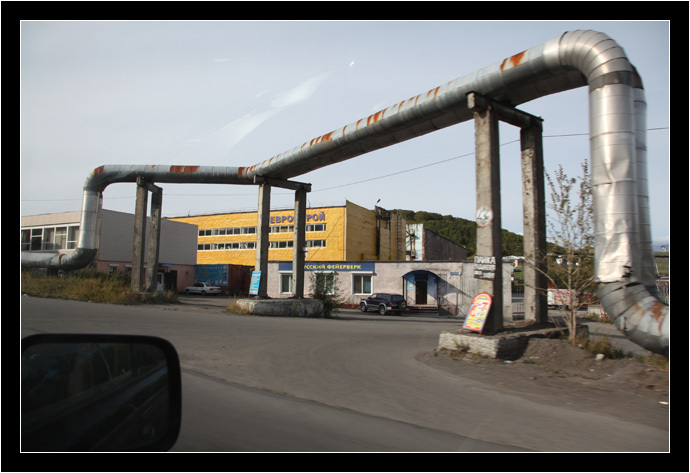 The pipes in the picture are insulated with cladding and run above ground – likely because the ground is permafrost. I have worked with exactly that type of insulation for external steam lines and you can see the same sort of piping at many places in northern Canada and Alaska as well. You are almost certainly correct. Any chemical engineer with chemical plant or refinery experience would instantly recognize this installation. Insulation is usually quite fragile, and the covering is intended to provide some mechanical protection. Unfortunately too often the insulation is fiberglass which is cheap and effective but also a sponge. Anywhere that the protective covering is breached allows rain to saturate the insulation and now that section of pipe becomes a more effective radiator than if it were naked to the air. I too would strongly recommend the first phrase in the story above be at least corrected to “poorly installed, poorly insulated, poorly maintained and rapidly deteriorating central steam and condensate water pipes” But, with a central power station, centrally administered in a don’t pay” = “don’t care” = “don’t fix” economy, that sends steam and hot water everywhere to all users, the losses and “waste” are even more exaggerated: Too hot? Open the window a bit. Ignore poorly closing doors or poor fitting windows or deteriorating door and window seals. Leave the front door open for a few seconds longer as you step outside. All these losses add up to increased UHI. So Russia is slightly warmer this Nov? Thats nice for those in the siberian regions, but this is a hail mary headline as the cold bites in the heavily populated regions of the northern hemisphere. As the team desperation increases I suspect the rumoured heat waves will grow where the weather stations don’t go. Just like Trenberth’s amazing hotspot,as it may only exist in the minds of the alarmed, it is fair to say it is probably in the same place they have their heads inserted. Of course I am still open to some empirical evidence of manmade global warming, after all these years, all that money, surely the team can produce something better than obsessing over 0.8C increase since 1850, when the quality of the measurement reading for most of that time is +/-1 degree, with a similar instrument error. I love the logic, we have a 2degree error range at best, anything less than that is noise. I can glean more meaningful information by looking for Jesus in the white noise of a TV . Climatology is less accurate than the soothsayers of old. what is the stated error bar? This week? 0.8C +/- 4C ? Adjusted by? At first, I had my doubts. But I downloaded the GISS homogenized data, and station list and selected all stations >= 45 North and >= 35 East. I calculated the 1951-1980 normals and departures for those stations. There were a whole slew of +5 to +8 anomalies. Tobol’sk even had +9.4. I took a closer look at it. The GISS data indicated a normal of -9.6 and a November value of -0.2. The site http://rp5.ru/Weather_archive_in_Tobolsk served as independant confirmation of the November 2013 monthly value of -0.2. I grew up in Alaska, and I can remember ladies there skiing in bikinis when I was 7 or 8 years old. (No snowboarding back then.) I’m 57 now, so we’re talking 5 decades ago! Nothing new under the sun, I’m afraid! I sometimes wish the word “anomaly” were never used again in climate science. The good guys lost about three-quarters of the PR battle when the other guys sneaked “anomalies” in as a means of understanding Earth’s non-global, non-mean non-temperature. Anthony, those pipes are clearly insulated. What you see on the outside is the galvanized steel outer shell that protects the insulation, fiberglass or asbestos, from the weather. Ask any union asbestos worker for a more clear explanation. Almost as silly as the concept of a global temperature, global average temperature, global mean temperature, and anomalies thereof. In America, you have browser to open tabs. In Soviet Russia, browser keeps tabs on you. In America, you catch cold. In Soviet Russia, cold catches you. The frigid, record cold in the US earlier this month and cold pattern for well over a month in North America and record warmth in Russia are very much related. Some of the coldest air masses in the Northern Hemisphere frequently form over Siberia and vicinity during the Winter months. At these high latitudes, there is very little daylight at this time of year and in fact in Northern parts of Siberia, the sun sets and it stays dark for many weeks. In the absence of milder air being transported in from distant locations, this massive land mass is able to radiate heat out for almost 24 hours a day(depending on cloud cover) and get colder and colder and colder. At times during a typical Winter, weather systems with strong winds will dislodge large chunks of this frigid air and transport it bodily in the direction of the steering currents/jet stream. This obviously causes bone chilling cold that developed in Siberia to effect places thousands of miles away. This year, we’ve had a blocking pattern with one of the anchors being a huge/anomalous Northeast Pacific upper level high that has persisted for over 6 weeks(if my memory is correct). Downstream from this high has been an upper level trough in Central/Eastern Canada. The flow/steering currents between these systems has been such that it has been transporting huge air masses, bodily from Siberia that move across the Arctic and into northern portions of North America/Canada. There has been an almost constant supply of these air masses, some of which continue south thru Canada into the US. Canada is normally very cold at this time of year but these air masses are even colder than what is average for Canada. This Arctic air, while traveling south thru mostly snow covered terrain and the long nights in Canada has not been modified a great deal by the time it crossed the US border. At the same time, when these frigid air masses move out of Siberia/Russia, they are replaced by milder(relative to average) air masses from places that are not as cold. This typically happens a few times every Winter and helps Siberia to warm a bit,temporarily, then resume getting colder and colder and colder again……..until the sun starts climbing in the sky later in Winter. Unlike most Winters, over the last 7 weeks or so, including much of Novembert, the movement of air out of Siberia, aimed in the direction of Canada, then sometimes continuing into the US, has been relentless. This has meant an almost constant flow of milder air from milder regions into Siberia/Russia, while a number of days later, North America is in the deep freeze. In recent cold Winters, a key factor has been a very negative AO. That atmospheric set up comes from an upper level/blocking Greenland high and below it, farther south into the Eastern US is an upper level trough. This year, the AO has been strongly positive most of the time during these cold outbreaks. Thanks, Mosh. This is undoubtedly the funniest thing I have read on this site. Mosh railing on Models, who would have thunk it. Not a side effect, it is intentional: normal “cold shower” water would freeze and burst any pipes. Any technical Russian can tell you that. Surface temperature and satellite-measured lower troposphere temperature often correlate poorly in Arctic areas in/near wintertime, and also at other times of the year over water or ice. This is because the air is stable due to low (sometimes negative at some altitudes) lapse rate. If the surface is unusually warm but convection to 2-3 kilometers above the surface does not occur, then the satellite-measured regional lower tropospheric temperature can fail to fully show an uptick in surface temperature. So it’s not greenhouse warming, but rather, all those hot water pipes running through those vast Russian cities that’s causing global warming? The logic is bullet-proof. Any discussion of “global temperature” is pointless. Your comment shows that you do not understand how localized heating from man’s activities can theoretically effect the thermometer records. If the recording thermometers are located in the tiny “pixel” along with the habitation, your thermometer readings will differ from those taken in a truly pristine area away from man’s activities. And most recording thermometers are naturally located near populated areas. Note that I am not claiming that UHI is responsible for this particular anomalous hot spot that is being discussed. Your comment shows that you do not understand how localized heating from man’s activities can theoretically effect the thermometer records. If the recording thermometers are located in the tiny “pixel” along with the habitation, your thermometer readings will differ from those taken in a truly pristine area away from man’s activities. I did not have thermometers or their siting in mind when I made that comment. I understand that satellite observations also show the anomaly (the UAH map above), and in my opinion, such a large and widespread anomaly cannot be caused by humans, whatever they do and however reckless they are with their heating. I have just found a data point that will allow you to estimate the total contribution from space heating in Russia. It is going to be a WAG, but anyway. In the town where I used to live (current population 21,000), all heat comes from one boiler station, whose design capacity is 220 Gcal/h. It was built according to state-wide norms, so it makes sense to presume that other central heaters in Russia have a similar output per unit population. There certainly are geographic and climatic variations, but most people live in average climatic conditions, and this town is as close to average as it can be (it is 100 km south of Moscow). So, assuming the boilers work at capacity (sometimes they do, in winter), we get 12 kW per person (that includes useful heat as well as losses, because we are calculating the boiler output). Add to that electrical losses of about 2 kW per person (this estimate exceeds the typical capacity of a Russian residential electrical feed). Make it 15 kW/person. There are industries, and I don’t know how to estimate their heat, but what we’ve got here includes all residential + offices + public buildings, &c. — a major heat source, all together. Make it 30 kW/person, to account for industries and transportation. With the current population of Russia of 140,000,000, we get 4.2 TW. The total electricity generation in Russia is about 0.1TW (according to IEA), so this is a very generous estimate for peak total heat. It translates to about 0.2 W/m2. It is the level of heat you get from a candle burning in a room. Run along back to SkS, they’re missing one of their head-nodders. I’m confused. Why is NCEP modeling thermometers on rooftops? Do the ones on roads fail after being run over by model trucks? Only the early model trucks. In the late model trucks the thermometer is inside the cab. NOAA continues to lie and rewrite historical data Orwell style, and there is an obvious UHI in Russia. I have personally been close to the weather station in Adler/Sochi, Rusia, near the Black Sea. I can say that this weather station in particular looked to me very, very well sited. I don’t have photos but as I am returning there in January I’ll see if I can take some. However I know nothing about the quality of the placement of the stations in the rest of Rusia. You guys are focusing too much on the warm anomalies they are capturing and not enough on what they are *missing*. Look at the coverage gaps in that data and notice how they coincide with places that appear to be relatively cool in the atmospheric measures or the reanalysis. *That* is the primary source for the difference in ranks. As for the Siberian winter hotspot, this is a very interesting pattern: there is a strong correspondence between dry, anticyclonic air masses, and the strongest cold season trends in the last 50-60 years. One underappreciated feature of the late twentieth century warming was just how much of it was warming of damn cold air. The warm air not so much. Of course, obviously I have concerns about the effects of communism on weather reporting there 50 years ago, but it is interesting nonetheless. It WAS mild, in Moscow anyhow. After snowing early. Reports were of fewer deaths of drunken Moscuvites – 95% down in last year. 130 are alive because they passed out on the pavement instead of snow. But please, tell us more about Swedes dying when the temp passes 25 in Stockholm. 1. Current measurements are accurate and cover the entire region. 2. Throughout the 20th century, the recorded data was similarly accurate and comprehensive. Percipient bloggers in this comment section suggest that there may be cogent socioeconomic reasons to suspect that point two may not be correct……..
NCDC is so obviously biased, that their climate reports are increasingly of limited value. Just bad luck they are in the cold part. Now they go looking forward in steat of back. A couple of posters have pointed to snow cover in Russia to try to refute the numbers given. It is a red herring. And is argued from temperate-climate-centric point of view. The snow cover is only relevant if the usual temperatures are marginal for snow. For instance in Southern England a raise of this magnitude will certainly affect snow cover. The ground temperature would hardly get low enough for snow to accumulate, even if it could form and fall. The area we are talking about is way, way colder than required for snow formation even if it is .78C warmer than ‘normal’. If anything the increased convection makes it more likely that snow will form. That’s not to say the numbers aren’t suspect…but arguing they are suspect because there is a lot of snow cover is specious. Thermometers on rooftops? Thermometers on roads? Thermometers of record only belong in car parks, and only if absolutely no car parks are available anywhere close, near an air-conditioner outlet. Everybody knows this! What on earth were NCEP thinking?! I like your explanation. I live in the northern part of Canada and we observe this a lot of the time. The jet-stream pulls the cold Siberian air right down on us on its way south. Also, faulty data seems to be a likely suspect for the extra “warmth”. And, how about more info or comment on the magnetic north pole movement??? Russian burocrats adding on average 0.5 of a degree centigrade by rounding off upwards when reporting temperatures, i.p. in winter. To show the bosses in Moscow how good they care for for their minions. NOAA is up to its old tricks. The red Siberian Hot Spot gives the layman the idea that Siberia is basking in in tropical temperatures. Most lay people don’t know that NOAA is depicting anomalies. If people want to know where the cold Siberian air masses are, they should look no further than North America. The atmosphere is dynamic, after-all. Here in Germany it is currently much warmer than in the past 4 years at this time of year. And via eastern wind in winter we are influenced by weather from Russia; at least Berlin and the Northern German plains where no mountains stop wind from the east. So at least part of the “hot spot” in Russia must be real it seems to me. According to Climate for You, Siberia develops semi permanent high pressure in winter due to extreme radiant cooling characteristic of the continental location and lack of sunlight. The northern hemispheres most extreme lows develop in valleys where inversion develops and temperatures are measured. In the summer and fall low pressure cyclones move across Siberia. The early Siberia snow cover in November would likely be associated with convection and latent heat release similar to spikes often seen in the tropics on satellite data. In addition inversions would not develop and temperatures would reflect the true atmospheric state as measured by satellite. Of course I only believe the Satellite data which is not as influenced by inversions siting and tampering issues. 12.9′C 20th century average? I thought it was 15′C, oh wait they revised it to 14′C, damn I’m confused. Maybe that is their diabolical plan. Living in Northern Canada, you get to live in an environment/place that us meteorologists greatly enjoy observing on weather maps and sometimes following especially close, like with this recent pattern(where the source region for some of our air masses is up there). Out of curiosity, approx. what is your latitude and what time does the sun rise and set today, December 20? It just so happens that there is a blob of heat the size of Russia centered on Russia? What are the odds of that? REPLY: I have been wondering the same thing for 5 years. I’ve seen this red spot come and go in Russia, and I don’t know what the reason is. Central Siberia in 1995 took over from the North Canada the North Hemisphere’s location of the magnetic ‘pole’, as you can see from the NOAA’s geomagnetic maps. I did some research into GMF variability at the fulcrum of the magnetic field changes (at both hemispheres) and to my surprise found good correlation with the sunspot cycle long term changes. Not much can be concluded from the above but in a way of a possible link to the temperatures variability this comment may have some relevance. Anthony, the lines that you identify as uninsulated look like they are not even connected. 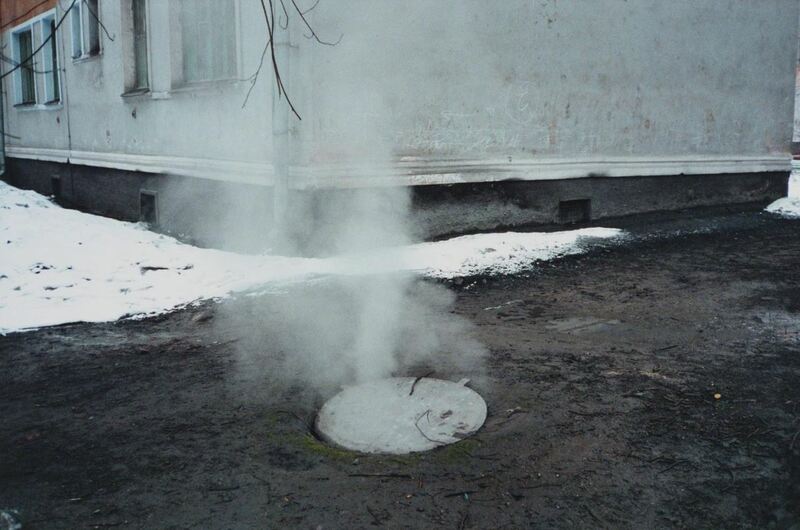 Regardless of that, uninsulated lines carrying cold water, hot water, or steam, in an environment where the temperatures regularly go below -10C will either freeze and possibly burst, or, in the case of steam, cause the steam to condense into water resulting in water hammer which will destroy a pipe in a very short time frame. Uninsulated lines will not last through a winter. P.S. Hot water lines do freeze – sometimes it seems they freeze faster than the cold water lines. Hello Mike, just in case you do not hear back from “Alberta”, here in Edmonton, Alberta, the latitude is 53.5 N and the sun rise is 8:48 A.M. and the sun set is 4:15 P.M. I know that this is just one month, but let me make a few observations on the UAH data. The Arctic is supposed to have the most rapid warming. This November it is running colder than normal, especially in Northern Greenland. Much of Russia is significantly warmer than average, which means the onset of those terrible winters is slower than normal. In Antarctica, the most rapid warming in the recent past is Antarctic Peninsula, which is at, or slightly below norm. Parts of East Antarctica have the highest global anomaly in November, but virtually no warming in the last 30 years. Slightly higher temperatures than normal extend into the eastern ice flows. It remains to be seen whether this will have an impact on the minimum ice extent in March. Overall, the picture looks strange, but in a positive way for life on earth. Even if this is true, is anyone upset that Siberia isn’t as bone-chilling cold as it used to be? So they leave out a cold month which will increase the average temp of the rest of the 11 months in comparison to the last whatever number of years baseline you choose because those data sets include all 12 months. Leave out July in a 12 month set and I bet it will be a cold year. Warmest November ever in Siberia is like saying Best May ever for the Chicago Cubs. Good one Vuk’s. Around 1992 is when they say that solar dipole ‘began,’ its slide down to its present low value, as well. In the UAH Lower Tropopause temp anomaly database (current version 5.6), 8 of the Novembers since 1999 had global average temp anomaly values equal to or higher to than the Nov 2013 value of 0.19 deg C. When are we going to rise up and demand our government employees stop spouting propaganda and get back to the science we are supposedly paying them for?